Family owned, supporting local farmers and artisans, and creating delicious food, in a comfortable and clean environment, is what they’re about! Specializing in grass fed burgers, kale & spinach salad, traditional tacos, humongous burritos, tap beer, and wine & bourbon; you’re sure to find something to complete your day in the Gorge! La Cabaña is the only Mexican restaurant in Slade, KY. The second best thing about La Cabaña is that they serve Ale 8 One. This soft drink has been bottled in Winchester, KY since 1926 and is the only soft drink invented in Kentucky still in existence. Enjoy a selection of Kentucky favorites along with a variety of traditional American cuisine in Hemlock Lodge’s 175-seat Sandstone Arches Restaurant. Sample a little bit of everything during our “all you can eat” buffets, available during peak times and on most weekends. Located on the edge of the Daniel Boone National Forest, Sky Bridge Station has everything you need to make your next trip to the Red River Gorge unforgettable. Whether you stop in to enjoy draft beer and a gourmet hot dog, or to pick up some last minute camping supplies, you are sure to leave with a smile. 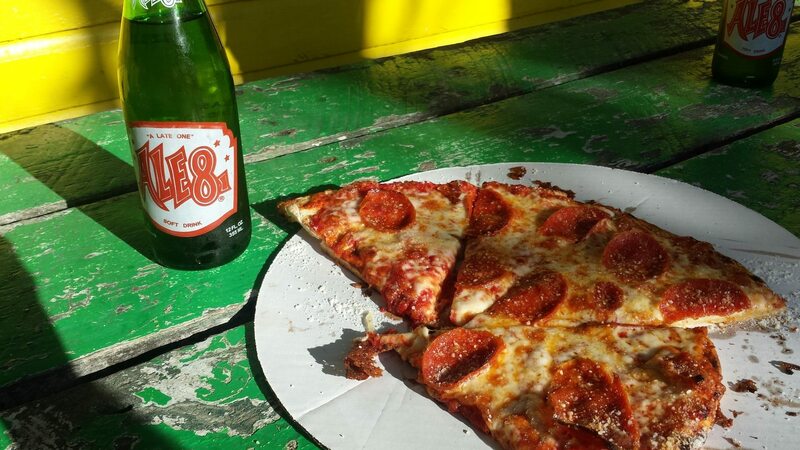 Miguel’s Pizza has been a Red River Gorge tradition since 1984. Miguel’s famous handmade crust and homemade sauce can be custom ordered with up to 45 very fresh and tasty topping choices, many of which are local farm fresh. Crust can also be ordered gluten free too. During the winter months some restaurants close for the season. Most open again in late February and early March. Give us a call at 606-663-0000 for updated information on the area.